One of the kids’ favorite things to do in the summer is to have a lemonade stand. They could sit for hours on the corner and wait for customers to buy a lemonade. This year, instead of lemonade, they sold sweet tea (I didn’t have any lemonade). Everyone loves sweet tea. It is much easier to make and is super cheap. I think that it will be our new product to sell. Because we live on a cul-de-sac, the kids moved their stand up to the corner where there is more chance for business. Amazingly, they made $22! Yes, $22. We have very generous neighbors at the new house. One person gave them a $5.00 bill and someone else gave them a $10.00. 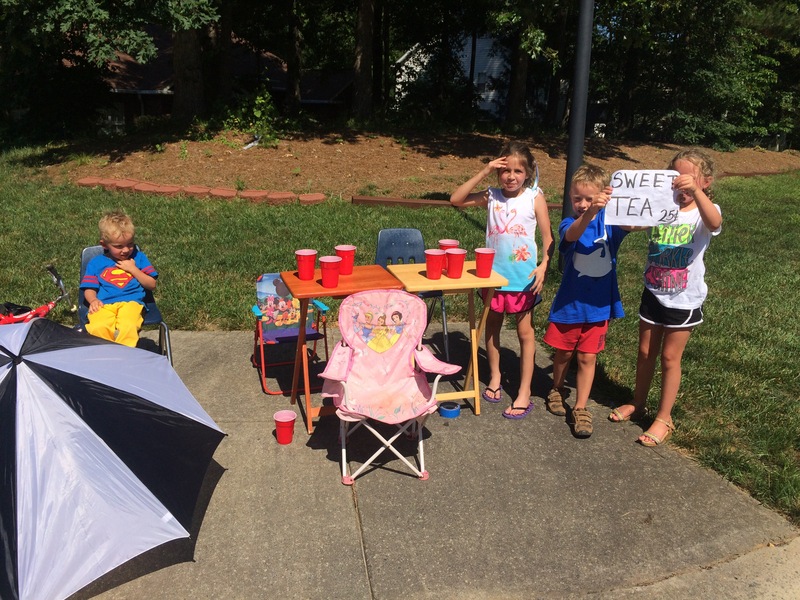 I don’t know who these people are but they have motivated my children to have a lemonade stand every day. I told the kids that they could only have a stand on Friday afternoons because novelty wears off when neighbors see them out there everyday trying to make money. Here is a picture of them with Faith’s friend, Kelsey…. Another fun summer activity is catching fireflies each evening. Our front yard (and the neighbors yard) is full of them. Firefly catching only happens during June and only for about 30 minutes each day. We are motivated to catch them as long as we can and as many as we can. I think Wilson had four in his hands at one time. 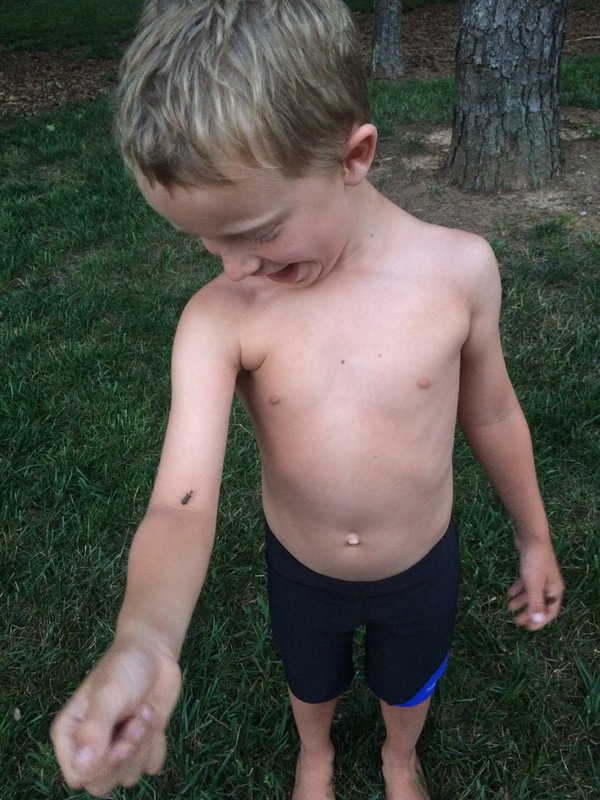 After catching them, the boys let the fireflies climb all over them. It is amazing how God created these fantastic little insects that glow and then He made them slow fliers so that they would be easy to catch. God was really thinking ahead and was giving us a wonderful gift all at the same time. Wilson has one on his arm…. 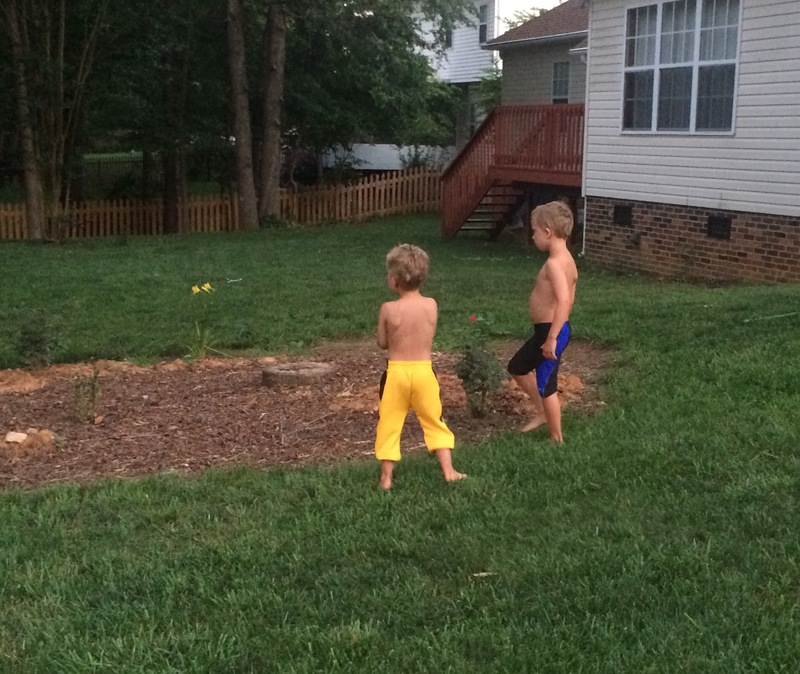 The boys hunting in the neighbors yard. They rarely have shirts on, if you haven’t noticed already….. This entry was posted in Uncategorized and tagged fireflies, Miller, wilson on June 18, 2016 by Becca. Summer is officially here! Not only are the kids out of school, but it is already 95 degrees and very humid. Thankfully, we have a swimming pool in the back yard. It is getting more use than I thought it would. The pool isn’t overly large, but it is big enough for three small children to play in and stay entertained. Sometimes the kids jump in and out within ten minutes, but most of the time they stay in for an hour playing on the giant Orca whale that Tom bought or kicking around on the boogie boards. Another nice feature near the pool is the shade that our house provides in the afternoons. I can sit outside and watch the kids swim without burning up or needing to get into the pool. It has been great!! Tom and I have been enjoying sitting outside and watching the kids swim. The pool has drastically increased our time spent outdoors. Even when it is 99 degrees outside, we have something to do outside without burning up. Of course, I have only been in it twice. The first time it was freezing cold and I jumped out immediately. I stayed in the second time a bit longer but it was still a bit cold for my taste. The great thing about kids is that they don’t care how cold it is – it is always worth it to get into a pool. (This has made me feel a bit old, to be honest.) I look forward to swimming in it more often after the water temperature increases to 80 degrees. But for now, I will watch the kids enjoy themselves in their new backyard and summer entertainment. This entry was posted in Uncategorized on June 15, 2016 by Becca. I am so proud of Faith and Wilson. They finished out the school year in amazing ways. They both got awards in various areas and proved that they could excel in being both a student and a friend. Wilson received an award for media and PE (not surprising). 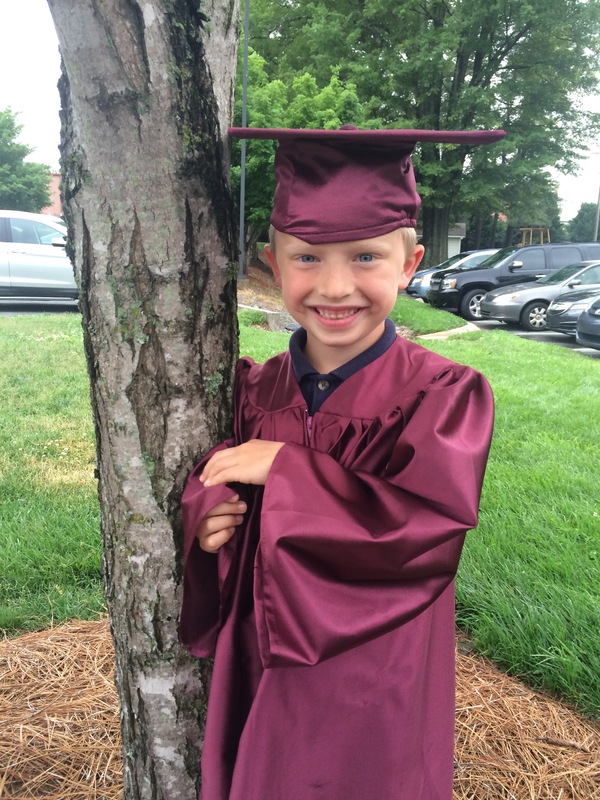 In his kindergarten class, his teacher gave him the “Bubbly personality” award. She described him as being a friend to everyone and skilled at bringing others into the group and making them feel comfortable. Wilson is such a sweet little boy with such a big heart. He is rough and tough on the outside, but inside he truly cares for others and is a friend to all. I saw this first hand when I went to school to have lunch with him one day. Wilson could invite one friend to sit with us and he chose a little boy that he had said many times that he didn’t particularly like. I was surprised by his choice. Later on I asked Wilson why he chose this little boy to eat with us and he said, “because he doesn’t usually get chosen and I wanted him to get a chance to sit with a friend at lunch”. That is my little Wilson. 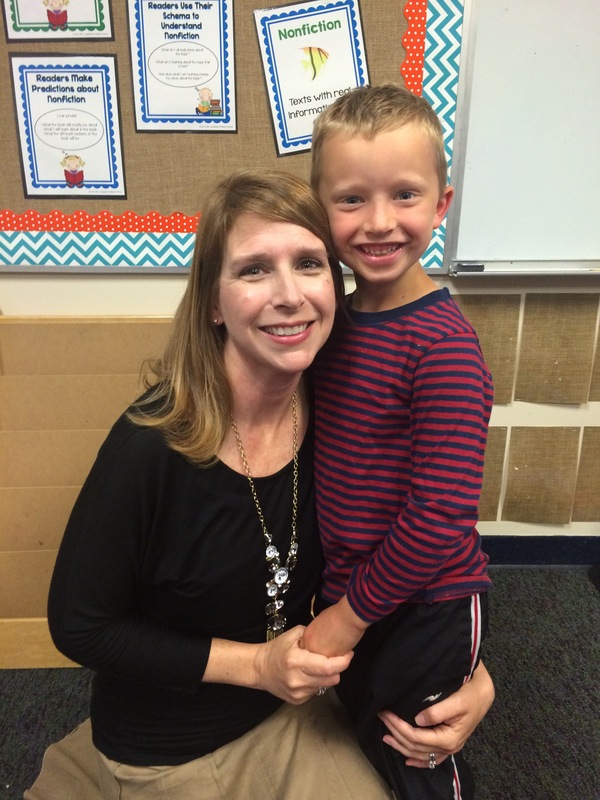 Here he is all ready for his kindergarten graduation and with his fabulous teacher, Mrs Fields. Faith received two awards. One was for Art, again, not surprising. 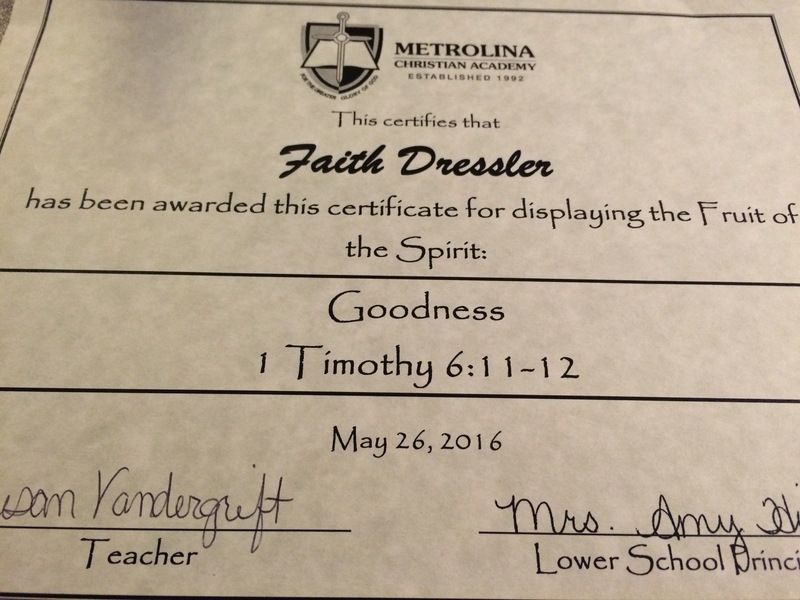 The other award was the Fruit of the Spirit award for Goodness. 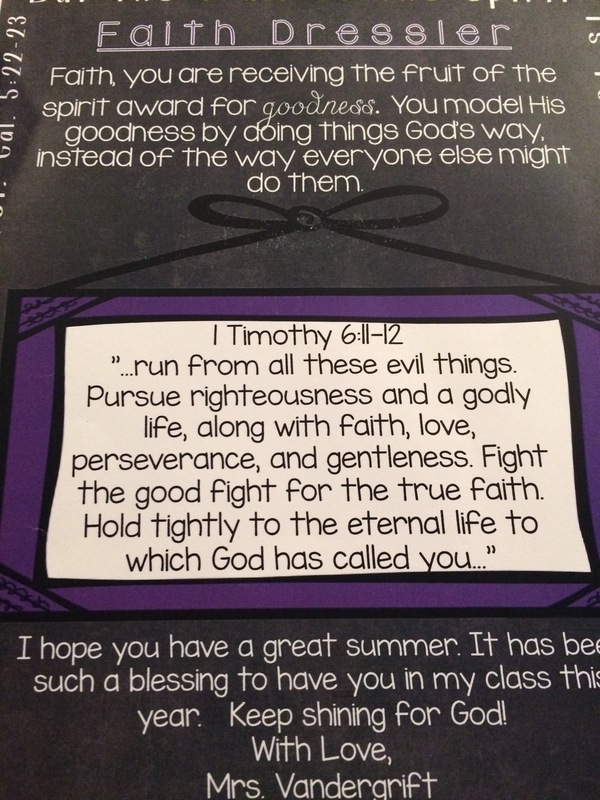 I loved her teacher’s description for the award, “You model His goodness by doing things God’s was instead of the way everyone else might do them.” Faith sometimes told me about how the kids at school would say something mean or tease another child. One day she said, “I would never laugh at someone like they do.” That is why she won this award. It was difficult for Faith to switch schools this year, but she did it with style and confidence. I am very proud of her success. 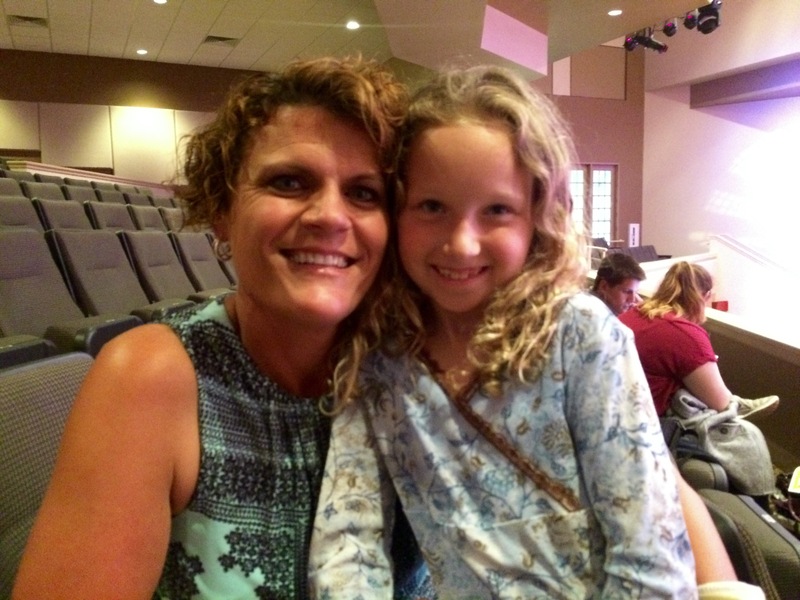 Here she is with her teacher, Mrs. Vandergrift…..
Our family had a great experience at Metrolina Christian Academy. The kids enjoyed the school year and they learned a good deal both academically and spiritually. I am very proud of them both. This entry was posted in Uncategorized and tagged awards, end of year, Faith, metrolina, wilson on June 14, 2016 by Becca.